Your love of music is no secret, and you know all the chords, rhythms and lyrics for genres from Mozart to modern pop. 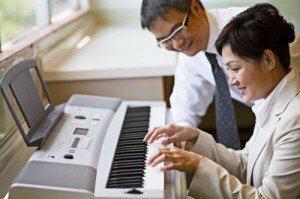 Consider using your knowledge and passion to teach others how to play and sing. Discover how to become a college music professor, and put your musical interest to work for you. These opportunities hone your talent and improve your skill so that you are taken seriously when you apply to college. They look good on your resume too. Your musical knowledge and skill may qualify you to teach lessons to children or teens, but you need higher education to teach at the college level. Look for several features as you evaluate and choose a school. The criteria include depth and reputation of the school’s music program, class size, school location and extracurricular organizations and opportunities. Cost is another consideration, so check for scholarships available for students just like you. Start by obtaining a bachelor’s degree. At an accredited traditional or online school, take classes in music theory, history and performance as well as general education classes like math, English and science. While pursuing your undergraduate degree, choose a musical performance track or focus on general music. Either way, earn good grades and work hard. You will need a graduate degree to teach in a college, and grad schools are more likely to accept you as a student if you demonstrate that you can successfully balance school, music practice and other obligations while mastering the material taught in class. During your senior year of undergraduate school, choose and apply to graduate schools. You’ll need a master’s degree and eventually a Ph.D. before you can earn a position as a tenured college music professor. Use graduate school to gain advanced music training and practical classroom experience. These lessons prepare you to teach advanced musicians, manage a classroom and work in a college classroom. According to Salary.com, college music professors make an average of $79,938 per year. Your actual salary depends on how many years you’ve been teaching, the school’s location and the prestige of the college’s program. In addition to a salary, you can earn money from musical endeavors you pursue outside of the classroom. Become a college music professor to share your passion for music. In this career, you’ll also encourage others to pursue their passion and train the next generation of music innovators. We invite you to fill out the form to learn more about becoming a college music professor.